Looking for a guide on how to download videos from Dailymotion? Did not find any interesting applications to make this work on your Mac? Are you looking for an easy-to-use online video downloading tool to download Dailymotion videos to your Mac? Then it's time to get to know Aimersoft YouTube Downloader for Mac. Aimersoft YouTube Downloader and Converter for Mac can download videos from Dailymotion as well as many other video sharing sites like YouTube, Hulu, Vimeo, VEVO, Metacafe and more. After downloading, you can also convert the videos to fit your mobile devices like iPhone, iPad, Android mobile phone and many more. This Dailymotion video downloader is fast and full of interesting features (including a preview of the video you are downloading in real time). Windows users who want to download and convert Dailymotion videos can have a try on Aimersoft YouTube Downloader, which is not only a video converter but also an online video downloader for Windows 8/7/XP/Vista. If you want to discover the new dailymotion video downloader, the first step you need to do is to download Aimersoft Youtube Downloader for Mac. 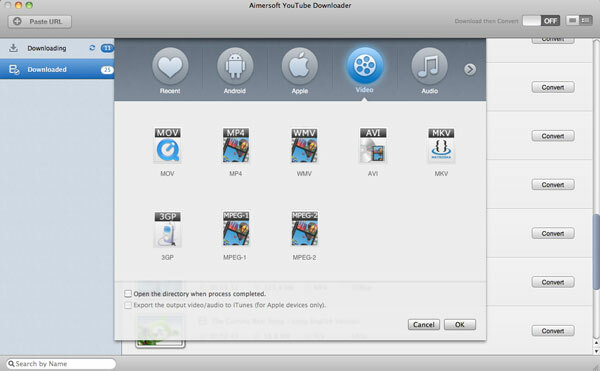 Once the downloading and installation are complete, start Aimersoft Youtube Downloader by clicking on its icon in the Applications folder of OS X. Search for the videos you like on Dailymotion by using Chrome, Safari or Firefox. There will pop up a download button. Click it and the videos you are watching will be downloaded automatically. Another way to download Dailymotion video is to click the Paste URL button on the left top side of the interface of this Dailymotion downloader, and add the Dailymotion URL (the URL of the video you want to download). After downloading successfully, you can convert the downloaded Dailymotion videos to any format you want. Just select the format you want and click OK to start the conversion. You can also change the folder where you download the videos from Dailymotion onto your Mac, click the Browse button and locate where you would like to save the video and in which format like MP4 format downloaded to your iTunes library. And if you're going to leave your dailymotion video downloader, you can set Aimersoft Youtube Downloader to automatically turn off the Mac when it has finished downloading. Hope you enjoy the Aimersoft Youtube Downloader. 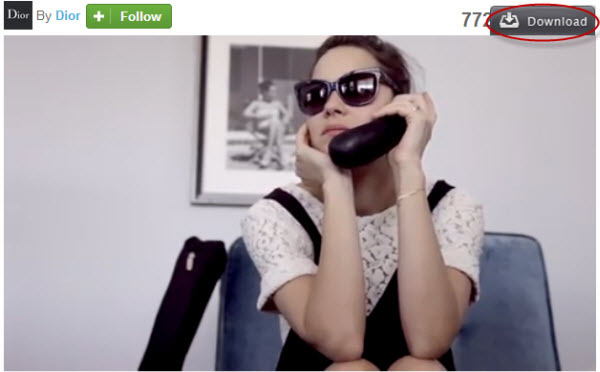 Dailymotion is a video sharing website where users can upload and view videos of other members. The website's headquarters is located in Paris, France and its current popularity rank is right behind YouTube. Internet surfers can register for free at the website and join the rest of its active members in enjoying uploaded video clips. However, there are users that were given the Motionmaker or Official User rank. These ranks pertain to the group of people who produce original video contents. They are mostly record labels, news media, film studios, sports associations, political parties, and television channels. Dailymotion comes with with a system that can help detect copyright videos and keep them from being uploaded on the website. The company supports only original films and not pirated ones. They do this to keep the integrity of the website and protect the legal owners of the videos. Downloading videos from DailyMotion on my Mac was nearly impossible before. But now with the Youtube Downloader and Converter for Mac, I'm able to get the videos I want downloaded. And, then after download, it's a simple process to convert to my favorite Apple devices including iPod and iPod. I've told all my friends about this great software and hope they will use it too. Hi, downloading Dailymotion videos is easy as pie if you apply Aimersoft YouTube Downloader for Mac. The steps is similar to downloading YouTube videos. So is dailymotion just like youtube or is it way different? I like the format of it but couldn't figure out how to download the videos. You make that look so easy! I have been trying to figure it out for a while and no one else could show me until I found your site. Thanks.